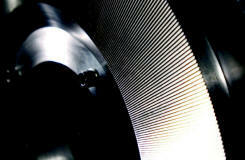 A granulator performs best and most economical when the blade is sharp. Regular knife changes and correct setting of the cutting gap help ensure a good final result and reduced power consumption. We keep blades in stock, as do our subsidiaries and agencies all over the world to supply you with a fresh blade whenever you need it. 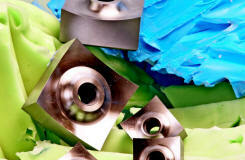 Our shredder knives can be turned once one side is worn out, this helps increase the blades lifetime. A shredders performs best and most economical when the knife is sharp. Regular knife changes and correct setting of the cutting gap help ensure a good final result and reduced power consumption. We keep knives in stock, as do our subsidiaries and agencies all over the world to supply you with fresh knives whenever you need it. The Pulverizers can be equipped with either segments or one piece grinding discs, both can be resharpened. 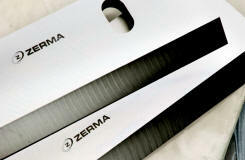 If you need help resharpening or replacing them, your local ZERMA agent will be able to help you. The right screen size can make a big difference in the performance of a machine, and sometimes you just need a new screen fast. Most standard screen sizes are available in stock, or can be manufactured quickly. 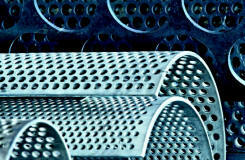 This includes screens made from wear resistant materials or stainless steel. From bolts to V-belts, there are many more parts to a ZERMA machine than knives, screens and rotors, but the spare part service is the same. 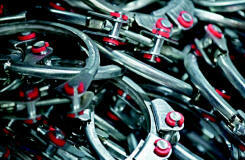 We keep most standard parts in stock available for a fast delivery, should you need it. Contact your local agent for more information and quick deliveries.